I adore baking sweet treats and apple pies, but this summer heat has got me dreading the use of an oven! 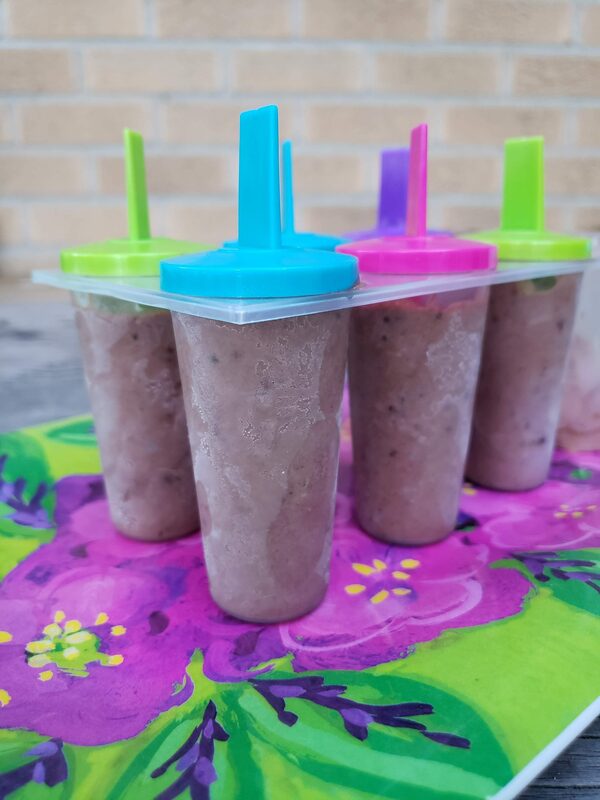 To satisfy my sweet tooth without melting in the kitchen, I made these mint oreo pudding pops and loved how they turned out! The best part is that you can have the kiddos help make these. You can also add really any kind of candy or cookie you want! A vanilla pudding with Reese’s Pieces or a Strawberries and Cream pop… YUM! 3 – we used the seasonal 4th of July Fireworks flavor- they have little pop rocks in them! Empty the pudding packet and the 2 cups cold milk into the large bowl. Beat the coconut milk and pudding mix in the large bowl with a whisk for 2 minutes. Put the cookies and Andes mints in a resealable plastic baggie. (TIP: I recommend freezing the mints a bit before this step, they melt so quickly!) Let your kids crush the cookies with a rolling pin. Add the cookies and mints + the 1/2 cup whipped topping the bowl. Stir until well blended. Carefully spoon the pudding mixture into the molds. We had enough to make two molds that have 8 popsicles each. Freeze util firm. Ours took about 4 hours. Enjoy! TIP: These are difficult to take out of the molds, so wait a minute or two and run some warm water on the bottom of the molds to wiggle the pops out. This looks so easy and yummy! I love mint! Those look great and relatively easy to make. I’m sure mint Oreo pudding pops are delicious. These look so good! Love the addition of mint. Sounds so fun for summer! What a great idea to get the kids involved with cooking these delicious looking pops. Right now, my air conditioner is out in the kitchen area and I dread cooking in there right now as well, especially in the hot summer, so these pops would be perfect to cool my family down. Plus they look so easy to make – I want those pop molds ASAP. Pinning and thank you so much for sharing! I can relate! No A/C is not fun! Thank you so much for reading and sharing, and I hope that your family loves them as much as mine! I am definitely making these my daughter loves mint chocolate chip ice cream, Oreos, and chocolate so this is a win. What a great idea! And I love that these can be modified. Looks really good! Going to try this one out this summer. Yummy!!!! Those lol delicious! I will be trying these with my daughter! Those look easy to make and so yummy. This looks so delicious! I absolutely love that you went outside to make these. I never think to take the kitchen outside instead of being cooped up in the house! Fresh air and making yummy treats would make for the perfect afternoon. I’ll be pinning these to make the next sunshiny day!